Yet having killed his mother and two students at the Pearl High School, Mississippi, deranged student Luke Woodham was disarmed by the Assistant Principal’s DEFENSIVE gun retrieved from his truck. Murderous shooting sprees were similarly stopped by DEFENSIVE GUNS at the New Life Church in Colorado Springs, at the Appalachian School of Law in Grundy, Virginia, etc, etc. See here and many more here. The left's knee-jerk response to such shootings is to repeat they have sensible gun-control laws that are just waiting to be passed in Congress. But their Orwellian idea of ”sensible” means laws that make it more difficult for responsible and qualified teachers to defend their children from deranged spree shooters. "The same folks who talk about fraudulent elections, institutionalized racism, and trigger-happy cops, also say only the government's agents should have guns. The contradictions are obvious." To save your children from gun violence, you need to listen to authorities with real expertise rather than to frightened students easily misled by deceptive propaganda proposed by the left-wing and Democrats who want to stop you being able to defend your family. There's lots more about such deceptive, ostensibly ”sensible" gun control laws here. 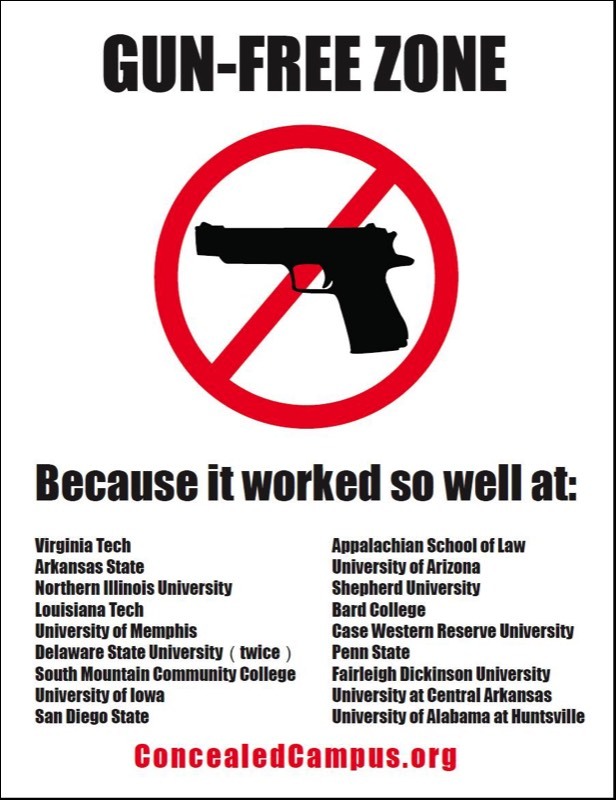 Could this be why Illinois prohibits guns on campuses, but teachers are training to protect their children anyway. After every shooting, Republicans can also have a law ready to propose - the Stop Mass Shootings Law maybe called something like the Personal Protection against Gun Violence Law. This is not only guaranteed to reduce the slaughter, it provides a vibrant contrast to the Democrats' deceptive proposals which history shows will do little or nothing to stop a school shooter from attacking your children. Democrats and many others ignore the fact that Columbine AND Sandy Hook AND the Stoneman Douglas High School in Parkland all had an armed security officer on site - yet they were ineffective in stopping the shooting! Rather arm multiple responsible teachers in each school instead - it's lots cheaper as well as FAR more effective. Neither the perpetrator's guns nor the NRA are responsible for the many killed at Stoneman Douglas High School, nor Columbine High School, nor Sandy Hook Elementary School, nor… Who but the mentally ill perps - along with those who ignored the troubling signs and the people who demonize your right to be able to defend your children - actually bear the blame? The country needs an effective proposal to counter the specious gun control demands of Senator Feinstein and the Democrats. The Parkland massacre was investigated by the Stoneman Douglas Commission which concluded 12-1 that teachers SHOULD be armed so they can stop school shooters. Mass shooting inevitably occur in gun-free zones, while millions of defensive gun users thwart millions of violent crimes each year. 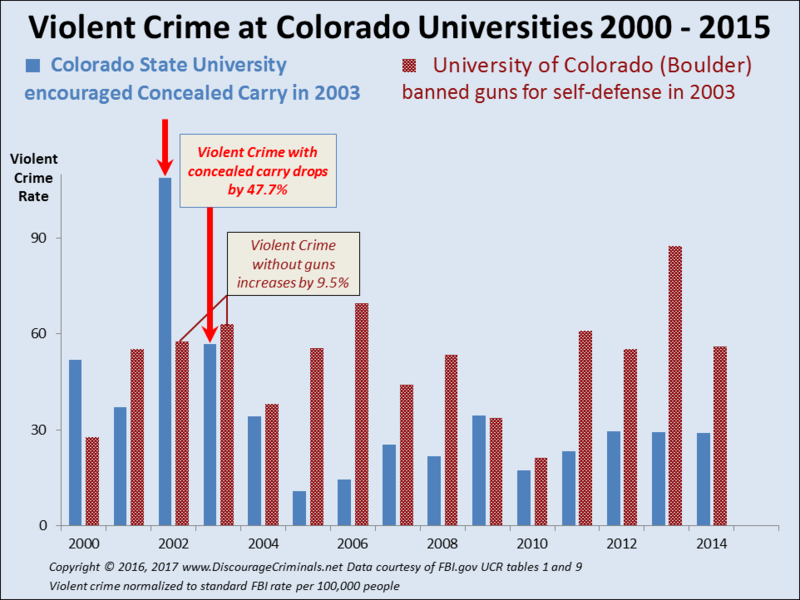 Unpublished CDC surveys conducted in the 1990s found around two and a half million (2,500,000) defensive gun uses every year. 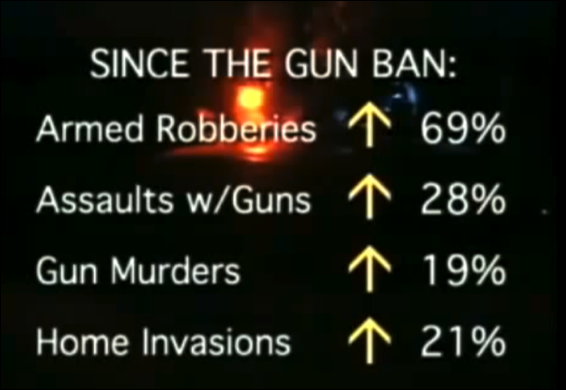 With the dramatic increase in the number of guns along with the equally dramatic decrease in violent crime, how many DGUs are there each year nowadays? Democrats resist what actually works - discouraging the bad guys by letting them know they're likely to be shot and injured. This means allowing each and every qualified teacher who wants to protect their students to be able to do so - unlike Sheriff Israel and his deputy. Anyone against allowing responsible teachers to be armed and able to protect their students is clearly a large part of the problem. Since the Giffords group against Gun Violence say they promote public safety, they ought to enthusiastically support discouraging criminals and the Personal Protection against Gun Violence law, but their irrational, radical interpretation of the Second Amendment sadly suggests otherwise. Only fanatical zealots deny you have a right to defend your family and your children from a violent criminal, so only talk about your right to defend your loved ones and your children. The wording is important, talk about defending your family NOT about guns. "After every mass shooting [whether by a long gun with some military-style features or not], the American people will know that a tool to reduce these massacres is sitting in Congress, ready for debate and a vote." The Stop Mass Shootings law could make it necessary for any new restrictive gun laws in the country to have a super majority to pass. It could restore MENS REA as the requirement to prosecute a violation of any gun law. There's lots more about protecting your children here, here and here. Motivate responsible teachers to protect their students. Implement the findings of the Parkland school shooting commission which recommends arming teachers . 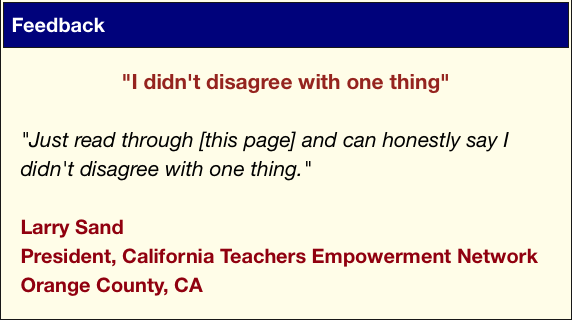 Empower qualified, responsible teachers in each school district to protect their students from a school shooter with a gun while allowing any district to opt out and choose their own policy. National Right to Carry. Just like driving licenses, make a gun license issued by one state be automatically valid in all other states. Motivate malpractice insurance. Empower and encourage cities to carry police officer malpractice and wrongful imprisonment insurance. Ensure governments do protect their citizens. Establish a federal cause of action against local and state governments for failure to protect their citizens if the injury is proximately caused by an inability to exercise self-defense. Accessible concealed carry licenses. Encourage more qualified people to be able to get a gun license by mandating that all gun licensing laws be "shall carry" rather than "may carry." Empower Concealed Carry. Specify that momentary disclosure of a gun by a flapping coat does NOT amount to open carry. Allow a concealed carry license to also allow open carry. 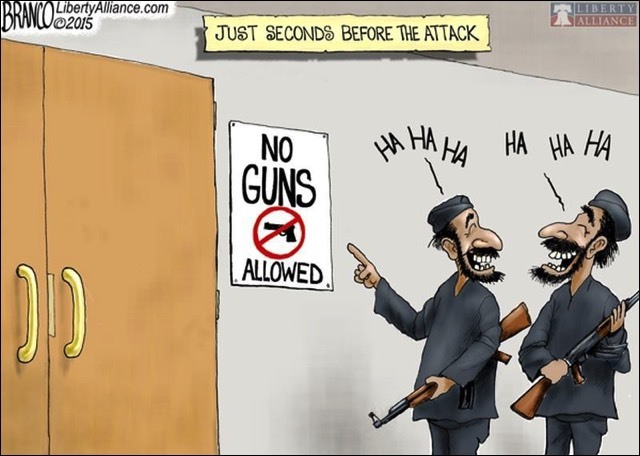 Change Second Amendment litigation rules. Make it easier for gun-owning plaintiffs to secure attorneys fees and costs. Hat-tip to Don Kilmer, San Jose, CA attorney who litigated the Alameda gun-rights case. Legislate your right to stand your ground. The nationwide default should allow you to stand your ground when attacked unless over-ridden by a state law. 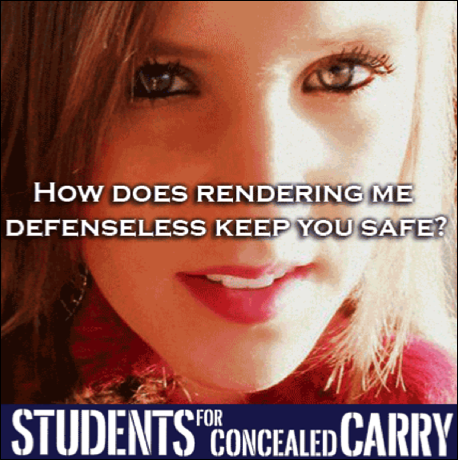 Affordable concealed carry licenses. Lower the cost of concealed carry licenses by ensuring each state's gun license costs no more than their driving license. Don Kilmer, San Jose CA attorney says: “If we can get plaintiffs’ lawyers on our side suing municipalities for onerous gun laws, that’s half the battle.” He went on to say “Imagine the discussions the local politicians will have with their risk managers about gun bans in parks and forest land from mountain lion attacks and two-legged predators. Or the sheriff who gets sued when a carjacking goes wrong against someone who was denied a CCW.” see here. Across the world, defensive guns are found to be unsurprisingly effective in decreasing violent crime, in marked contrast to the dismal failure of gun control measures. This image gives the results of the Australian mandatory gun buy-back and helps explain why Chicago and New York with such stringent gun control have so much violent crime. 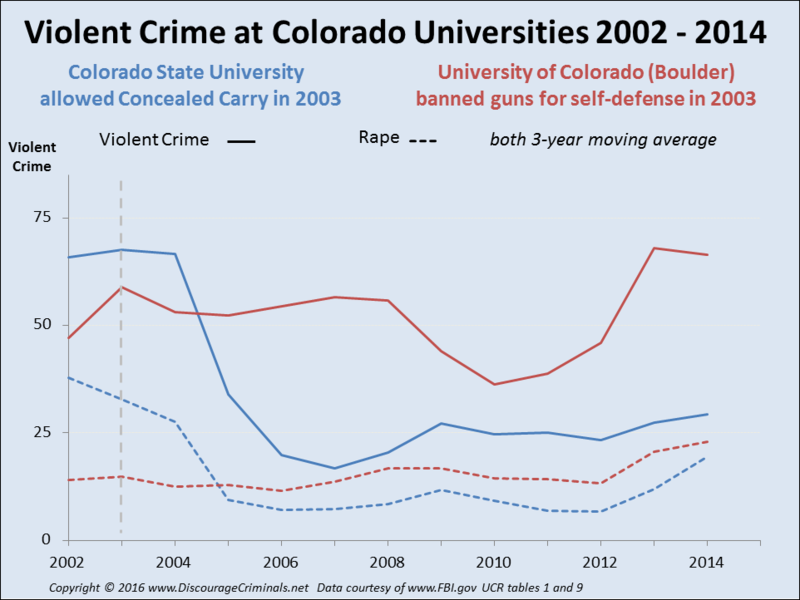 Peer-reviewed studies find that MORE guns in defensive hands correlate significantly with LESS violent crime. Now that Britain enforces a near-total ban on guns, the UK Telegraph reports that: "The United Kingdom is the violent crime capital of Europe and has one of the highest rates of violence in the world, worse even than America, according to the European Commission." The Harvard University Academic study by Professors Kates and Mauser found that violent crime decreases as more citizens have guns. They also found that developed countries which ban guns have murder rates far higher than those with high rates of gun ownership. "Luxembourg, where handguns are totally banned and ownership of any kind of gun is minimal, had a murder rate nine times higher than Germany in 2002." How can you stop an armed shooter? ’West Virginia University advises ... “act with physical aggression and throw items at the active shooter.” These items could include “student desks, keys, shoes, belts, books, cell phones, iPods, book bags, laptops, pens, pencils, etc.”’ The online references have all disappeared, but do I recall it was past Vice-President Democrat Joe Biden who originally recommended throwing a book at an active shooter? See here and here. Effective protection for your children. It's simple to protect your children from a school shooter - just ensure the school has armed teachers to deter or shoot an assailant. If you trust your school teachers to educate your children, they are also trust-worthy enough to protect your children. Discourage school shooters. 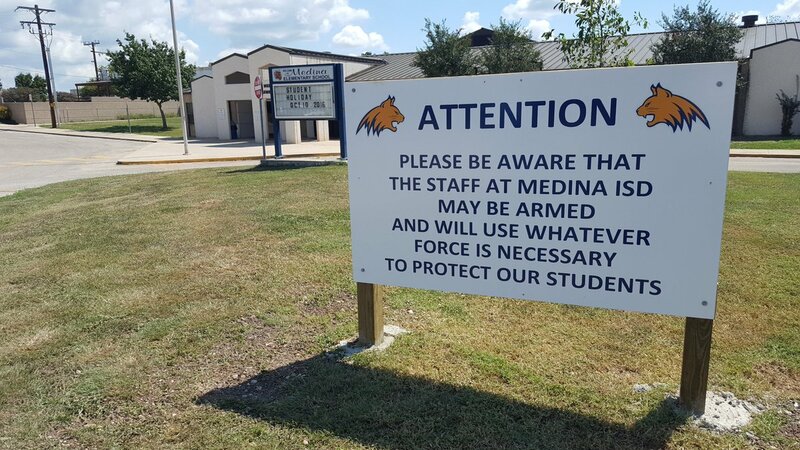 Authorizing responsible teachers and staff to concealed carry to protect their students by default in every school district across the country will give deranged individuals a very strong message - don't do it! Very low cost. Teachers defending your children would cost very little. Their school would have an unknown number of defenders and since teachers and staff are already employed by the school, you don't need to pay each School Security Officer's salary. More defensive gun uses. Since each and every defensive gun use either stops or lessens the impact of a violent crime, more defensive gun uses means less violent crime. Recent reports confirm continuing democratic and liberal media bias, equivocation and disinformation over many, many years, see here and here. There are many, many advantages to stopping school shootings by discouraging criminals, see here. The famous economist Frédéric Bastiat’s “broken window” economic fallacy explains why this law will do so much to stop school shootings. So don't let the perfect become the enemy of the good. Some say it's not okay to fire automatic weapons in the middle of a crowded neighborhood or a cinema. To use bullets that go through one brick wall after another, through innocent bystanders, through babies and through children, one after another. We agree! Response. But the people who initiate such violence are all violent criminals so we need to discourage them from shooting the innocent. They will not be able to get more guns than they do now, but this law will empower peaceful citizens and responsible teachers to defend themselves, their families, and their children. The key insight is that violent criminals and mentally disturbed individuals do NOT know who is armed. Discouragement works, James Holmes the shooter in the Batman Aurora movie-theater drove past nearer cinemas to gun-free Century-21 where the ban on defensive guns enabled him to kill 12 people and injure 70. Those against people and teachers being able to defend their students and their families with a gun pretend that guns kill people. So do cars - cars kill more people per year than guns, although they are more often used for transport people than to offensively kill them. 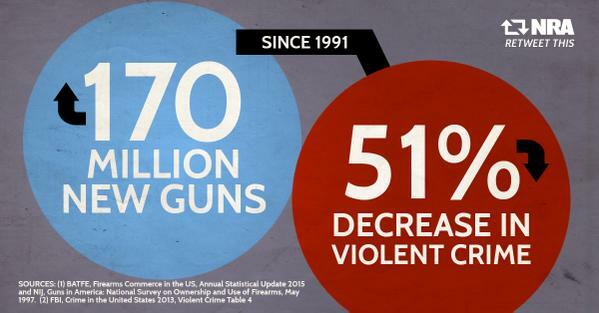 And guns used defensively kill criminals not innocent people and students. 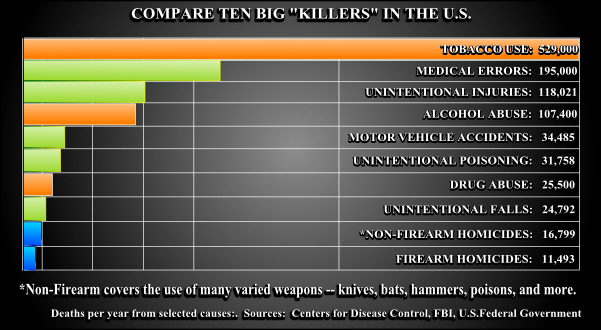 To reduce the number of children dying from accidents then shouldn't you address the biggest killers first? This would mean first banning cars, then swimming pools, medicine, beds, hammers, ropes and don't forget to cut off people's fists. There are various other measures to help stop mass shootings and decrease the misinformation about gun violence. Some can be implemented by the government, others in your own speech and actions. This outstanding TED talk explains how Apple and other great leaders inspire action. 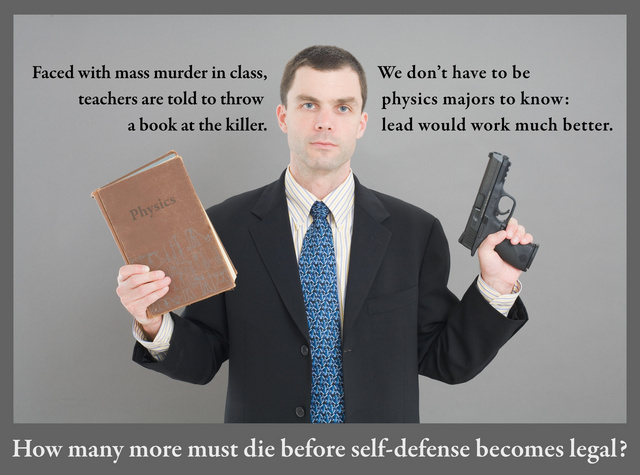 First focus on #1, WHY - your right to defend yourself. Only later talk about #2, HOW - by supporting the 2nd Amendment. #3, WHAT you actually do to be able to defend yourself - own a gun - comes LAST. So talk about your right to defend yourself, your children and your loved ones rather than 2A or owning a gun. The CDC should conduct another statistically valid Defensive Gun Uses survey to find the current annual number, there have been none since the mid 1990s which found over two million DGUs per year. Reinstate the annual unbiased DGU surveys conducted by the CDC. Fact. Most of the unreported two million defensive gun uses every year avert a violent crime, showing that your defensive gun both discourages violent attack and decreases gun violence. Insist on being called the right-to-self-defense lobby NOT the gun lobby. Call the gun-control lobby the anti-self-defense lobby or the deny-your-ability-to-defend-your-children lobby. Avoid mentioning guns since it's such an emotive word for snowflakes. When hassled by gun control supporters, ask do why Chicago and New York have such high gun violence since they have such drastic gun control? They need to explain why similar sized cities Chicago and Houston have such different gun violence rates. If a gun control supporter insists that gun control does work, ask him to explain the causal path. How do you trace, from start to finish, the steps from the ban on guns to the decrease in violent crime that you believe it produces? But unlike the Stop Mass Shootings law, the deluded Senator's Assault Weapons Ban contains nothing to discourage the next disturbed student or violent criminal from such a massacre. "Armed Pilots and Air Marshals on planes help to keep us safe. Armed guards and bailiffs at the courthouse help to keep us safe. Armed men and women on Coast Guard boats along the coasts, on the rivers and lakes and at sea help keep us all safe. Why are Democrats so unable to understand this concept?" - Victor Nazarian, Aerospace Engineer & Project Manager @ NASA, Coast Guard Aux. IP Flotilla Commander - flight officer @KGAI & boat crew @ Coast Guard Station St. Inigoes. 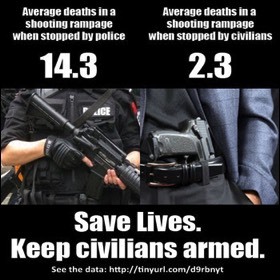 Average deaths in a shooting rampage when stopped by police: 14.3. But average deaths when stopped by civilians: far less - just 2.3. When women and seniors are armed, they can defend themselves from attack by often young, male and much stronger violent criminals, rapists, and terrorists. 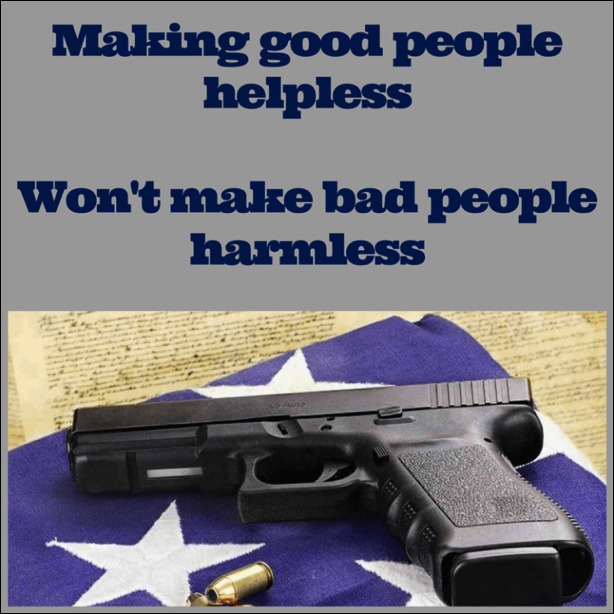 So we encourage responsible law-abiding citizens, those who pass the background checks, to be able to protect themselves, their family and their property. Despite negativity and media misunderstanding, Discouraging Criminals is neither Mandatory Gun Ownership nor Compulsory Gun Ownership, it's simply your choice.